But if you ask me, is this worth the hype (or mortgage)? It’s a solid YES. The owner, Teoh Kar Sing is still the ever affable fellow squeezing his creativity juices flowing into the creations that rotate every few months, and still make it a point to come to your table and share his thoughts and gain insights from you. To be fair to Lucky Restaurant, not everything on their menu is priced exorbitantly. 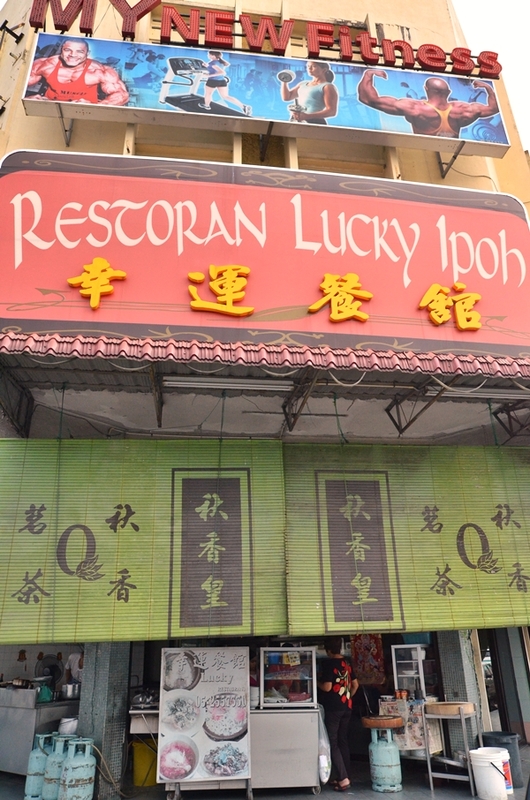 Even if it’s so, you’re still paying for top notch quality seafood; painstakingly cooked to your liking and dishes that you won’t be able to find anywhere else in Ipoh. Simpler items like Prawn Wanton Noodles and Roasted Pork are still being served, if you’re here for a simpler meal or still chomping on grass and rocks while waiting for your pay cheque. 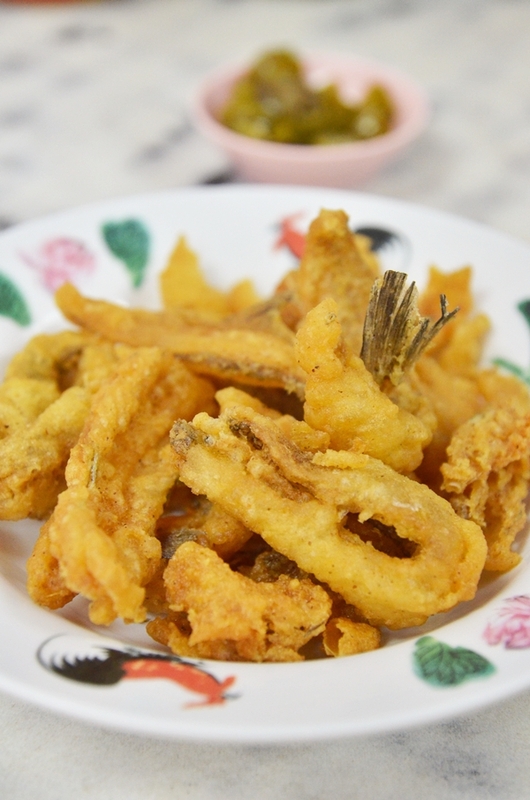 Fried Fish Appetizer; bones, tails and all – Seriously addictive snack, we found ourselves hankering for more after only a good few seconds on the table before vanishing in sight. The wait for our food took a good one hour. Seriously. The kitchen is still manned by Teoh himself, and a few helpers, hence you can be rest assured of the utmost importance exerted onto the standard of cooking. 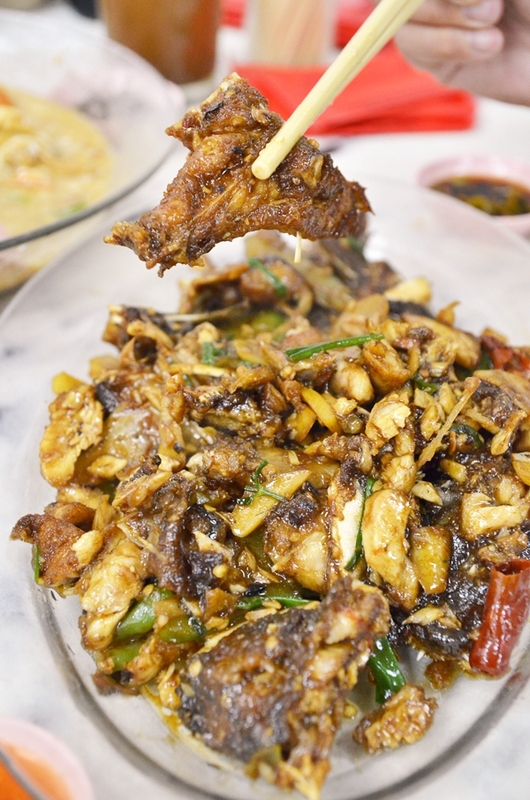 We had to make do with the crispy fried fish that tasted so much like Sa Zhui fish but I was not sure. Every table had a plate and by all means, go all out and order more! Really crispy batter coating the fresh tiny slivers of fish whetting the appetite for more. 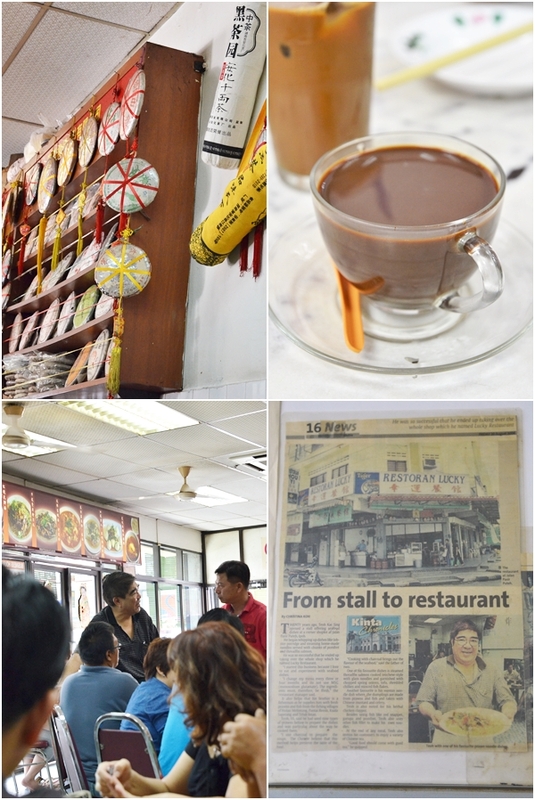 Though the hour long wait made us wishing that we sampled a bowl of their famed Prawn Wanton soup or plate of crispy Roast Pork as well. 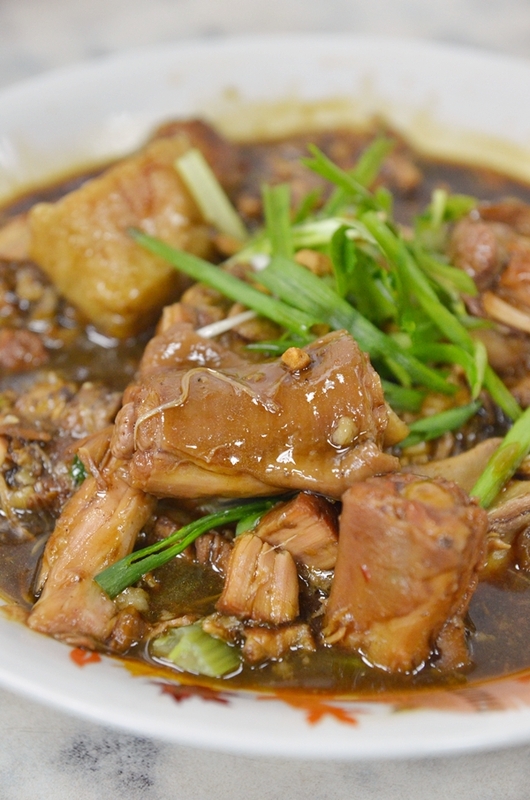 Braised Pig’s Tail (RM25/USD8) with a heavily-spiced gravy of cinnamon and pepper; the meat fell off the tail bone with ease and this would have been magical with a steaming hot bowl of white rice. Stir-Fried Grouper Fish Head with dried chillies, black bean, scallions, ginger and garlic (RM55USD18) was another excellent recommendation, though if you’re not fond of bony parts of a fish, settle for a steamed whole fish or filleted version instead. 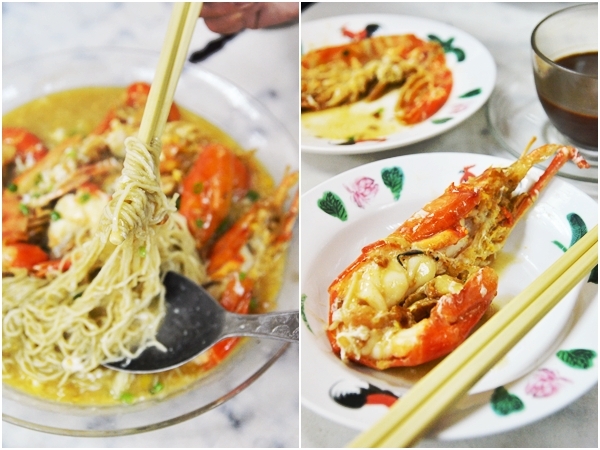 Highlight of the feast – The thickened gravy loaded with sweetness from the prawns, and orange-coloured, glimmering roes is tasty enough to be sipped on its own. Also highly recommended is their Steamed fish fillet (usually threadfin salmon, grouper, or you can go all out and order the “loong dan” or estuary grouper) with homemade noodles, scallions and ginger. Or try their Fish Noodle Soup; made out of real fish hence lending an inherent sweetness to the pot of soup; complete with a QQ texture (al dente) that spoke volume of its freshness. 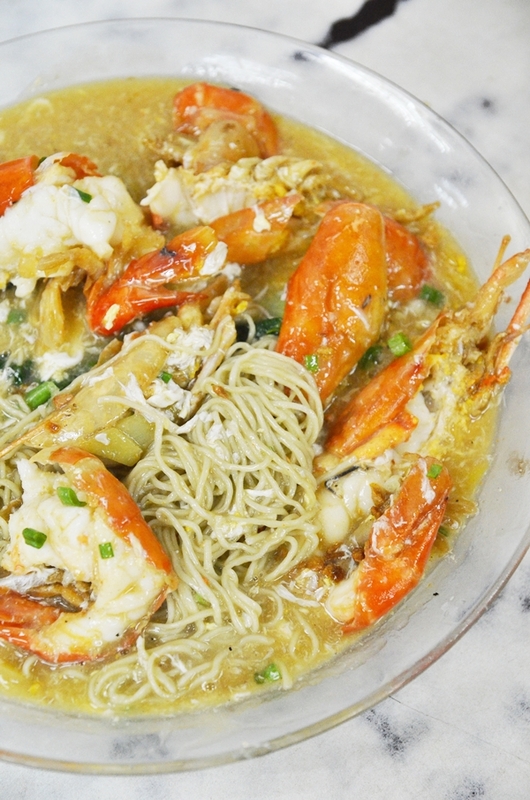 The Sang Har Meen (Freshwater Prawns Noodles) here basically commands a following. Really. Just so happened that I had a serving of Sang Har Wat Tan Hor at Pan Heong @ Batu Caves; a respected institution in its own right a few days before; hence the comparison. Both were good but Lucky Restaurant’s version had that slight edge of a larger crustacean served. Don’t miss this. 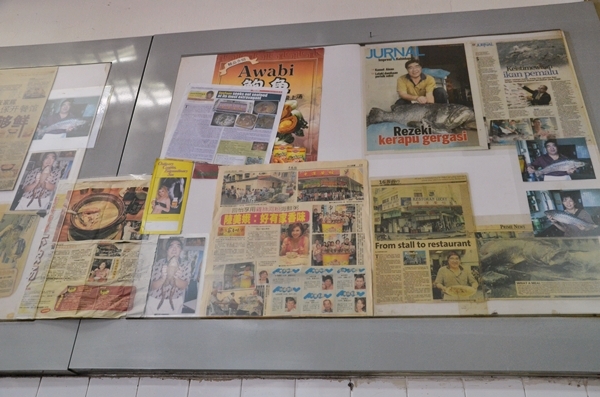 *This is a corner lot next to the Caltex station along Jalan Pasir Puteh, opposite of the former Maybank. I’ve always passed this restaurant whenever I go to Maybank in the same are, but I never knew the restaurant serves such delicious food ! Every local knows eating there is like eating gold…If you ask the boss to recommend fish not in the menu, then prepare to pay the gold price..